Yesterday, conservative group Turning Point USA (TPUSA) launched a website, Professor Watchlist, “to expose and document college professors who discriminate against conservative students, promote anti-American values, and advance leftist propaganda in the classroom.” Visitors, the website states, may use the Watchlist to “see if any of [their] professors have records of opposing freedom of speech on campus.” They may also submit new names to the list. Some free speech advocates and professors whose names are on the list have voiced concerns about the website. FIRE will be watching closely for adverse action against the professors. We want to make two things clear at the outset: First, TPUSA does have the right to draw up such a list, but, second, professors who may be facing discipline or punishment due to their constitutionally protected speech should contact FIRE right away. TPUSA’s Watchlist appears to have multiple goals, including promoting free expression and pushing back against “leftist” views. The former is, of course, consistent with FIRE’s mission; the latter is outside the scope of FIRE’s work. We encourage any student who is censored or punished by campus authorities because of his or her beliefs—conservative, liberal, or otherwise—to submit a case to FIRE. To the extent that any group encourages students to fight back against viewpoint-based censorship and punishment, we commend it. 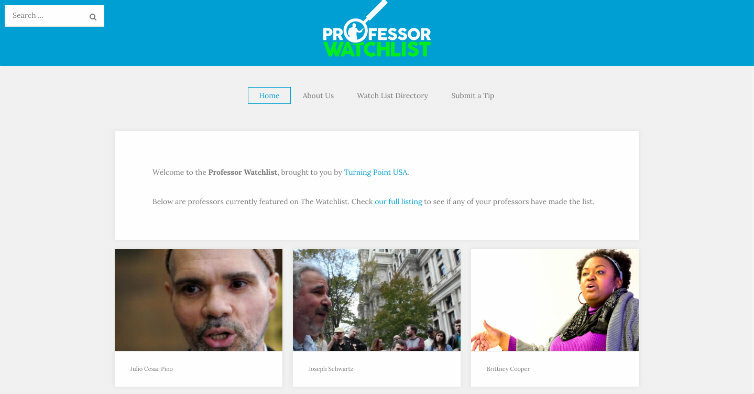 Because the Watchlist specifies reasons for professors’ inclusion on the list, website users can decide for themselves whether TPUSA is objecting to a professor for his or her suppression of speech or whether TPUSA simply disagrees with the professor’s viewpoints. Users can also conduct their own fact-checking; as Inside Higher Ed reported today, some entries on the list “include alleged errors of fact or interpretation.” Listees are already speaking out in their own defense, and the public conversations about each professor’s circumstances are likely to be ongoing. Critics of the list are even taking to Twitter with the hashtag #trollprofwatchlist, naming names like Dr. John Hammond of Jurassic Park and Gilderoy Lockhart of Harry Potter’s Hogwarts School of Witchcraft and Wizardry. To be clear: If NAS’ project encourages universities to punish professors for their opinions, FIRE will oppose it in those cases, as we would anyone else with a similar agenda. If, however, the project serves merely to criticize professors for their scholarship, while that would certainly not be a FIRE issue, it is NAS’ right to do so. If you are a student or professor who has been punished or censored because of your viewpoint, contact FIRE. If you disagree with the views espoused by your professors, by TPUSA, or by any other person or group, speak up and make your voice heard.